Which Sheets To Choose? Don't Overlook This Layer! Big, soft, and cozy comforters for college are the first things that come to mind when most people think of dorm bedding. But dorm sheets are just as critical a part of your college bedding, and their importance can’t be overstated. Why? Sheets are the first layer of your dorm bedding! You’ll be wrapping yourself up in your Twin XL Sheets night after night, so it’s quite important to pick out a good set of sheets. Not all sheets are the same, however. While they should be XL Twin sheets to make sure they’ll fit your dorm bed, here’s a quick rundown on the different materials and types of sheets that DormCo offers. DormCo’s microfiber sheets, such as its UltraSoft Dorm Bedding Sheets and Supersoft Twin XL Bedding Sheets are made of high-quailty microfiber. Since microfiber is a polyester, some can be quick to dismiss these sheets as inferior to cotton or other natural materials. Well, they’re not! In fact, microfiber even feels softer than cotton or is comparable to super-soft, high-thread-count cotton. Since microfiber costs less than cotton but is just as soft (and actually softer in some cases), it’s truly the material of choice for many. If you’re a fan of cotton, we’ve got cotton sheets too! With 230-thread count, 300-thread count, and 400-thread count cotton sheets for college, there are plenty of colors to choose from. Cotton sheets have the advantage of being a natural material, and who doesn’t like keeping it natural? Cotton is also a durable material that’s machine washable. A durable fabric is important so it can make it through your college years, and since your dorm bed often serves as a seat, you’ll want a more durable fabric. Cotton sheets for college are also more breathable than other materials, so you’ll stay warm in the winter and cooler in the warmer months. 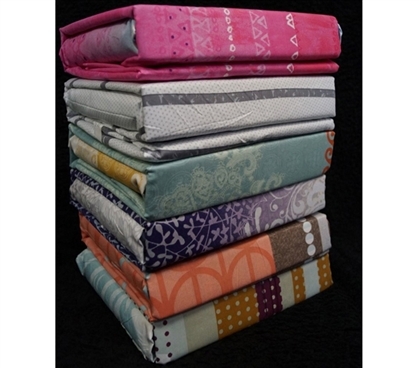 Jersey Knit Twin XL sheets are also cotton sheets, but they have a different feel to them. They’re durable, since they’re cotton, but these dorm sheets have a soft, t-shirt-like feel, and that’s their defining feature. You’ll find plenty of colors available amid our Jersey Knit sheets for college bedding. All, of course, are sized Twin XL so they’ll be the right size for your dorm bedding! 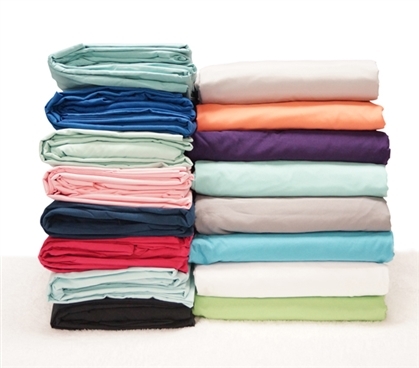 For ultimate comfort and relaxation, try out our Softest Ever Coral Fleece Sheets! These are some seriously soft and warm sheets. In fact, they’re almost more like college blankets because they’re thicker and are very warm. Thanks to the 330GSM material, these are college sheets that are ready to redefine what you think of as soft. If you’re looking for maximum coziness during the colder months, then look no further. Just add these dorm sheets to your college bedding and you’ll wonder how you ever slept without them before.